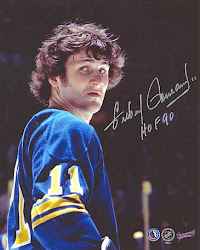 buffalosabresnow: After 14-plus seasons, and a $75M payroll, why is Darcy Regier discussing .500 hockey? After 14-plus seasons, and a $75M payroll, why is Darcy Regier discussing .500 hockey? Is it possible to be at .500 with 61 games played? Only in the NHL. It's impossible in any of the other four major American sports. But, in the NHL, the Buffalo Sabres pulled to 27-27-7 with a win last night vs. Boston. The first number is the number of wins, the second is the number of losses in regulation and the last number, for all of you non-hockey fans, is the number of losses the Sabres had in overtime or the shootout. So the number of wins that Buffalo has this season is 27. 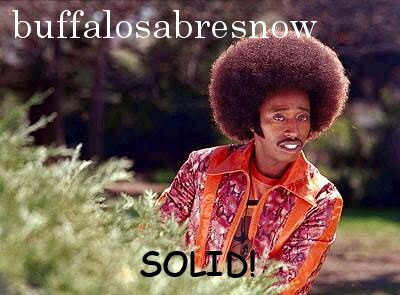 The cumulative number of losses the Sabres have is 34. Since they get a "loser point" for the seven overtime/shootout losses, it equates to the Sabres earning 61 of a possible 122 points. Which, of course, is .500 hockey. Fine, I get it. Always have. So, what is .500 in GM Darcy Regier's mind? Well, he laid it out yesterday on WGR's Schopp and the Bulldog. The question asked by Schopp was how Regier looks at a teams record, "[do] you do it the NHL's way with [calculating] .500?" he asked. "No, no. I do it the right way," said Regier, "you guys got it wrong." He continued, "If you look at the teams in the standings...it's games over .500." Schopp then asked for a definition using this as an example, "Whats 30-26-7? Is it four [games] over .500 or three [games] under?" To which Regier replies, "Four over." Fine, I see where he's coming from. The chase is on for eighth place and no one's sure who the Sabres are chasing. For instance; right now Florida is in eighth place in the conference, second in the Southeast Division by one point. But, they have four games in hand on division leading Winnipeg. Washington is right behind Florida, one point back, but has played two more games. They're two points back of Winnipeg, but have played two less games. Toronto is tied with Washington in points and games played and is one point back of Florida having played two more games. Now, if I get where Regier's coming from, Florida is seven games over .500, Winnipeg, Washington and Toronto are all four games over .500 and Buffalo is presently at .500. OK. So who is Buffalo chasing? Apparently it's Winnipeg because, according to Regier, "The lowest team is four [games] over [.500.] That's the team in. [You need] to look at the team with the lowest number of games over .500 that is in the playoffs, that is the team you are competing against." OK. Got it. Since Winnipeg is in the playoffs right now and is four games over .500 they are the team to chase. Because they're not in the playoffs, Washington and Toronto, who are both also "four games over .500," are not the teams to chase, and won't be until they're in the playoff picture. I'm glad they didn't get into "wins in regulation and overtime" which is the first tiebreaker in the NHL standings. FYI, right now it would go like this: Washington--29; Winnipeg, Toronto--26; Florida--24; Buffalo--21. Which complicates things even more. Regier's point at least adds some structure to the Sabres chase for a playoff spot. My point is this, though, you would think that with nearly 15 years on the job and a payroll this season of roughly $75M, Regier would be discussing the Northeast Division crown and or a battle for home-ice in the first round of the playoffs. Not, how to define .500 and who, amongst four teams, Buffalo is chasing the for 8th spot in the conference.